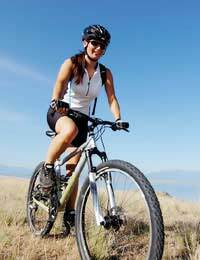 Mountain biking is a sport that invites cyclists to ride their bikes off-road, often through rocky or rough terrain in beautiful wilderness. Riders use specially equipped mountain bikes that are suitable for overcoming obstacles as they navigate rough trails, but also comfortable enough to stay on for extended periods of time. Your child will be ready to start riding a mountain bike as soon as he or she learns to ride a regular bicycle confidently. When they do, the world is their oyster: mountain biking is a fantastic sport that is fun for the entire family, and helps to develop both mental and physical skills. It also is a great way to see the Big Outdoors! Is Mountain Biking Safe for Kids? Sports like mountain bikes have inherent risks for children, but you can reduce them by following simple rules. Get them the right gear and a bike that's right for them, and teach them to recognise when a trail is inappropriate or too difficult, and to be cognisant of the limitations of their own abilities. Remember, children need to be confident cyclists before attempting to ride a mountain bike, as it is much more difficult to manage dirt than a simple pavement. Don't take them out until they can ride a bicycle well, and have a good sense of balance as well as a quick reaction time to unexpected happenings. Camps or classes for budding mountain bikers can be a good idea. They will learn off-road skills, trail-riding etiquette and basic bike skills as well as bicycle maintenance and safety measures. Most camps and courses accept children from age eight, although this will vary from place to place. Cross-Country. Most popular, requires an XC bike. A variety of terrain is traversed. Downhill. Does what it says on the tin. Often riders get uphill by means of a ski lift or other conveyance, then go down. Need a lightweight downhill bike for this. Freeride. Anything goes, more aggressive than downhill etc. Requires a heavier bike. Dirt Jumping. Popping wheelies, or becoming airborne after riding over clumps of dirt. An acquired taste and an acquired skill. Trials. Trials bikes have no saddle and are good for jumping over various obstacles. Possibility of injury needs to be taken seriously with mountain bikes, when children and adults alike are involved. Get the right gear to avoid being sorry instead of safe. Helmets. Helmets need to be light and comfortable while providing full protection, while cross-country ones need to be extremely well-ventilated and comfortable as well. Body Armour and Pads. Depending on the difficulty of the terrain you attempt, armour ranges from padded neoprene clothes to protect elbows and knees to full body armour. Gloves also offer protection against a variety of falls. Water Hydration System. Take this one seriously if you are out for a long period of time – dehydration can be dangerous for children and a small water bottle often isn't enough. The Right Clothes. Don't wear trousers that can get tangled up in pedals or clothes that are too hot or not warm enough. They need to be comfortable and provide enough protection as well. First Aid Kit. Always take one with you wherever you ride, and learn beforehand how to clean cuts and even splint a broken arm or leg. Mountain biking can be an adventure for the entire family. Mountain bike holidays in particular can be amazing experiences for children, allowing them to keep fit by seeing things in nature accessible only by bike. Staying on trails also teaches them about the necessity of preserving the earth's fragile eco-system, and how important it is for all of us to care for the environment.